Remember the popular game Color Switch? It is a game where the player has to pass a specifically colored ball through many obstacles corresponding to the ball’s color. So, keeping that in mind, we have tried, played and reviewed a list of many other games similar to Color Switch, which require little energy, and can be played at any time. Well, here is one of the most addictive and fun games like Color Switch you should play - Color Swap. Color Swap is here to take you on a color switch adventure. 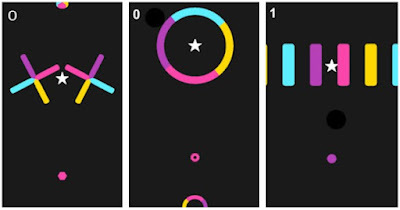 This addictive arcade game is launched on the Android platform by AndviGames, a developer team who managed to design a game with beautiful HD and minimalistic graphics, cool music/sounds and a very challenging and reflex-teasing gameplay. Get your fingers ready for some color swap and read on to learn how to play. The main objective in this awesome game is to navigate the ball upward, through tons of colored obstacles. Simply tap the ball to control it and be careful of the obstacles’ colors. Your colored ball can only travel safely through barriers of the same color. The obstacles are presented in different ways, so you will see all kinds of spinning triangles and cubes with different colored sides, multi-colored vertical bands that move, etc. Use a lighter tap to hover the ball while waiting for the correct color, or tap the ball harder to move it forward. Also, you will be able to switch the color of your ball with some power-ups on your way through. Get higher scores, win levels and last as long as possible to become the ultimate color swapper. Color Swap is an arcade game with a simple, fun gameplay and beautiful graphics, offering hours of playing time, completely for free! Check it out on the following Google Play link.